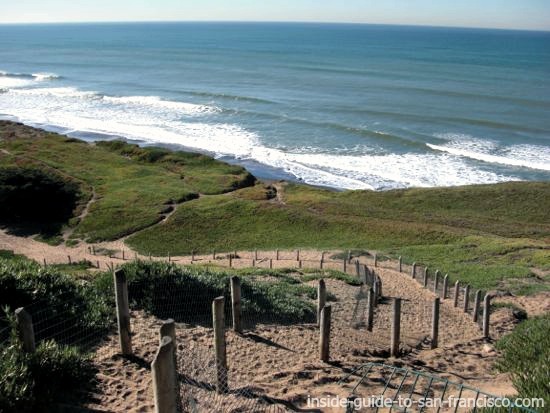 Fort Funston may be the prettiest of all the San Francisco beaches. 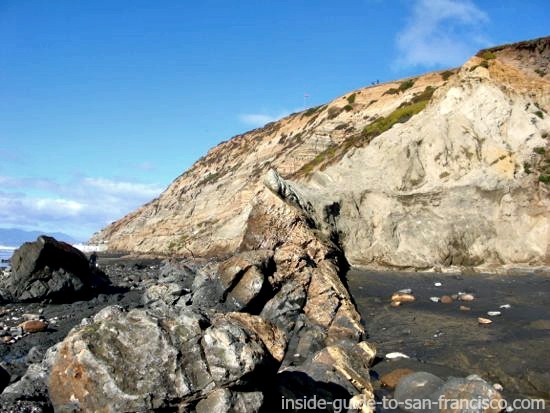 Sandy cliffs drop 200 feet to a beautiful beach at the southernmost edge of San Francisco. 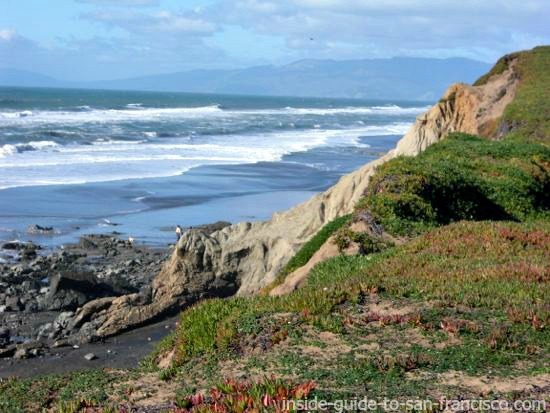 This is the wildest of the San Francisco beaches and the views are gorgeous. This beach seems to be a local secret. 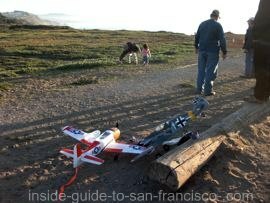 But it's well known to San Franciscans with dogs and it's a very popular spot for hang gliding and flying remote-controlled airplanes off the cliffs. The cliff in the photo below is the one the hang gliders take off from. You can see two people at the top. Some people ride horses on the beach, from Mar Vista Stable nearby, but there have been so many complaints about the way the horses are treated, I don't recommend it anymore. 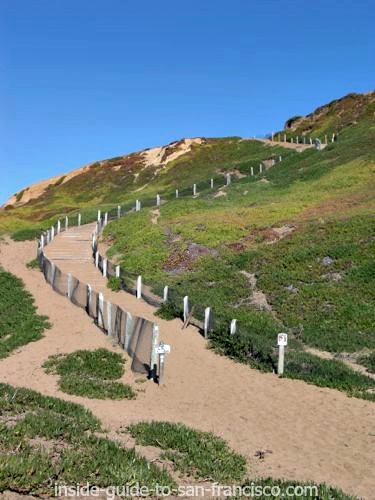 From the parking lot on top of the cliffs, there is a steep, rugged path going down to the beach. The view on the way down is really beautiful, with ice plant clinging to the cliff sides and the breakers crashing on the sand below. It's quite a workout climbing back up to the parking lot. 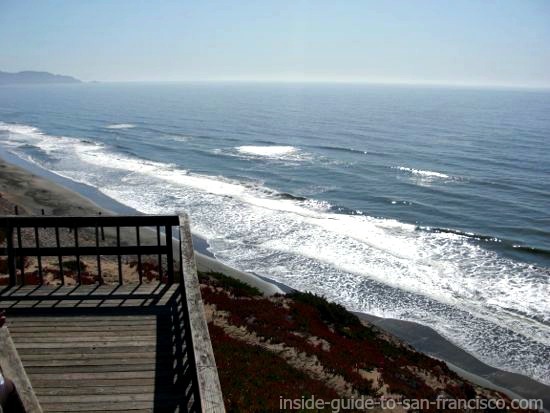 The beach starts south of Ocean Beach and runs along the bluffs for about a quarter of a mile. With a really high tide, the water comes all the way up to the cliff, but most of the time there is plenty of room to walk. It's about a twenty minute walk from one end to the other. Keep an eye out just past the breakers for Bottle Nose dolphins, seals and an occasional whale. This is not a swimming beach; the undertow is deadly and the current along the coast is very strong. Occasionally you will see surfers out there, but it is way too dangerous for the rest of us. If you're not up for the steep climb down to the beach and back, there are flat paths along the tops of the cliffs with great views as well. Just head right from the parking lot. The path starts out paved, turns to sand here and there, and rambles along the cliff top. It then heads through a wooded area, and winds down to the lower level. 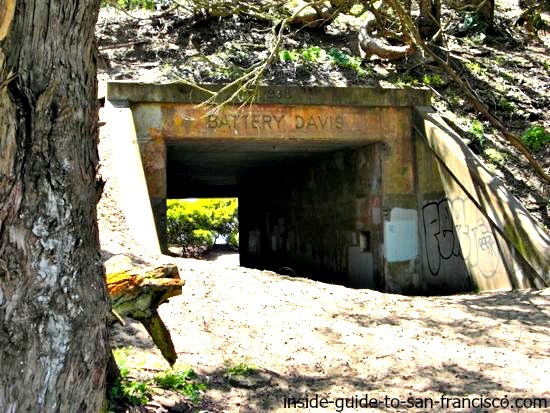 The World War 2 ruin, Battery Davis, has a tunnel that connects the main path with smaller ones nearer the sea. The path winds around, heading towards Ocean Beach, but doesn't quite get there. Right next to the parking lot there is a platform (with an old gun battery). From here you can look both ways, up and down the coast, and watch the hang gliders. 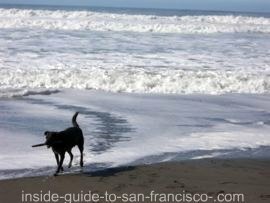 Fort Funston is the most popular of the "dog beaches" in San Francisco, beaches where dogs are allowed to run off leash. 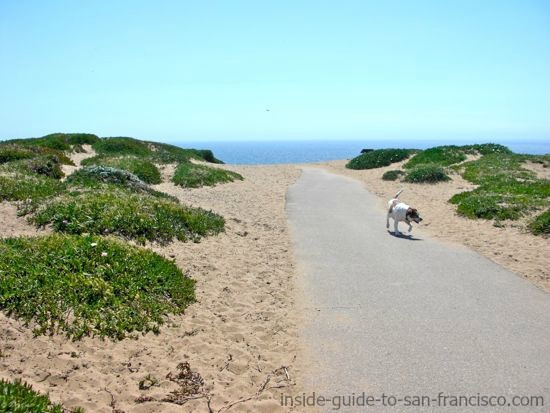 Dogs love going to Fort Funston, judging by all the smiling faces and wagging tails! 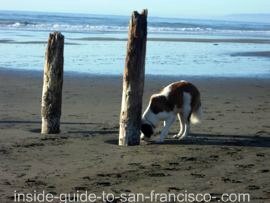 The luckiest dogs in San Francisco come here to run on the beach, ears flying, and chase sticks in the surf. They even have their own faucet for water and a supply of litter bags for their staff. Most of the dog activity is on weekends and after work. 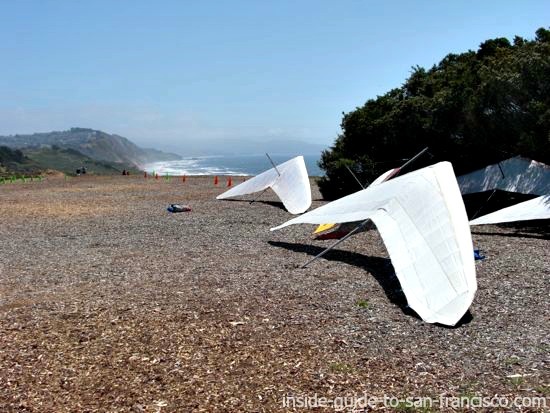 Most people come here to stroll on the beach or play with their dogs, but this is also a favorite spot for hang gliders and remote-controlled airplane enthusiasts. The updrafts from the beach and the strong onshore airflow create the perfect lift for hang gliding when the conditions are right. The strongest winds off the ocean are usually blowing in spring and summer, so that's when you'll see the most hang gliders. 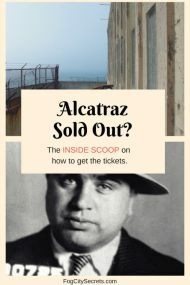 There is a flat area along the cliff covered with wood shavings which is set aside for take-offs and landing, just to the left of the parking lot. The best spot to watch the hang gliders from is the viewing platform near the parking lot. Interested in doing some flying? Contact the local hang gliding club at www.flyfunston.org. 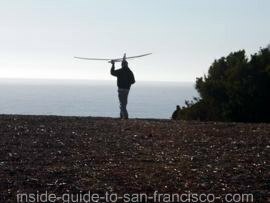 There are usually a number of people near the parking lot flying their remote-controlled airplanes and comparing notes on their machines. From the cliff top they can fly the planes out over the water. When to Go. There are a lot more people and dogs on the weekends, so during the week is less busy. However, I've never found it to be crowded-feeling even then, because the people are spread out. The prettiest time is just about an hour before sunset as the sun is going down over the Pacific Ocean. High Tides. Want to avoid the really high tides? 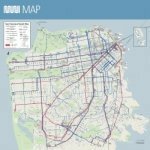 Check out the Tide Tables for San Francisco. Easy Walking Paths. From the parking lot, there are paved paths heading off to the right that are flat and accessible to wheelchairs for part of the way. The views along the way are lovely. The ramp to the viewing platform is also wheelchair accessible. Bathrooms. The only bathrooms are the port-a-potties next to the parking lot. Go before you come! Real bathrooms have been promised for years. Turnoff for the Beach. 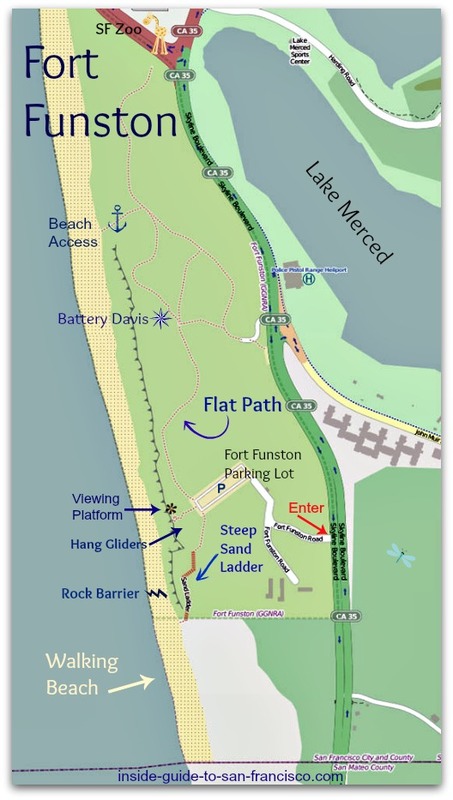 Coming from San Francisco, don't turn off at the first Fort Funston sign at the intersection with John Muir Drive. You'll have a long walk. Go through the light and turn off at the second sign, which will take you to the parking lot for the beach. Safety Issues. I've already mentioned the swimming dangers, but there is another one. The cliffs look solid but they're made of sand. 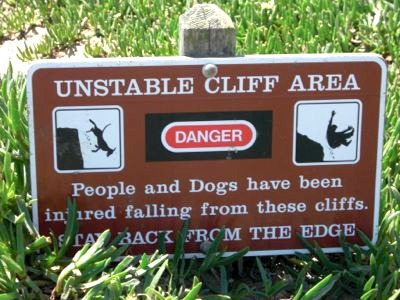 Don't walk out to the edges of the cliffs; they can easily crumble and the drop is 200 feet. People have been seriously hurt there. Don't let the dog go out there either. 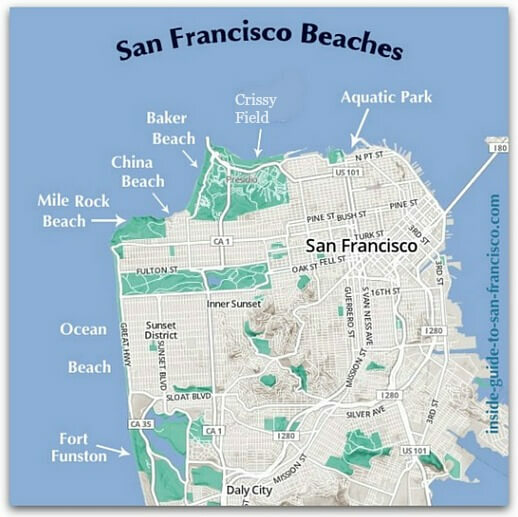 The beach is at the southern edge of San Francisco on Skyline Boulevard, about 3 minutes from the SF Zoo. 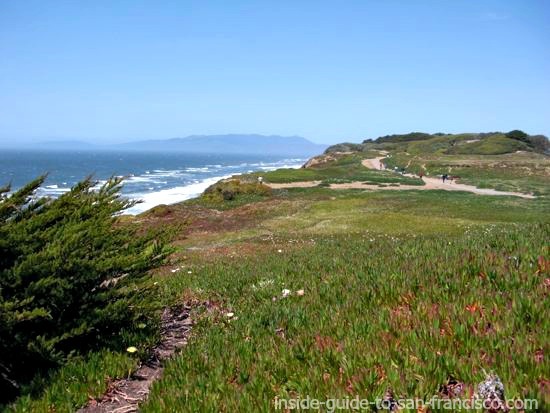 Take Sloat Boulevard all the way to the ocean. Turn left onto The Great Highway and keep going. This will become Skyline Boulevard. 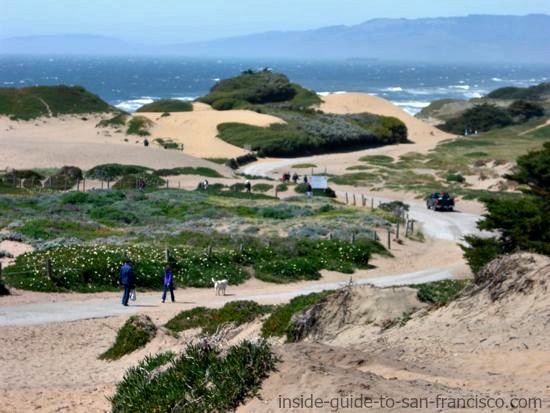 Ignore the first sign for Fort Funston at the traffic light at John Muir Drive. Go through the light and a little farther on you'll see the second sign. Turn in and follow the road to the parking lot. It's a big lot and parking is free. 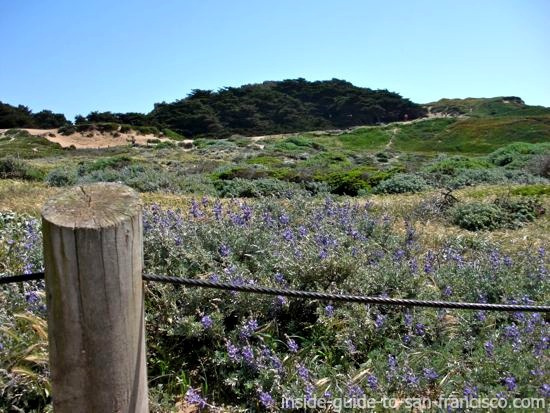 Take the John Daly Blvd exit and go north on Skyline Blvd till you see the sign for Fort Funston.